ah yes, another set of nights. hmph. yesterday and today me and marcus did the best thing you can do on a weekend...buy a paper and take it to a pub, whereby you sit with as many drinks as it takes to go through each supplement in that paper. bliss. my wicker basket is now fixed onto the front of my bike. i went to see Monsters v Aliens. i have to say, the giant robot scene was very War of the Worlds, right down to the noises. if i was 5, id have been scared!! 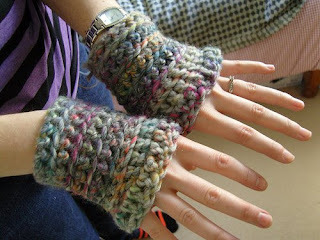 i crocheted myself some fingerless gloves, taking the pattern from my 'i love crochet' book. had another go at an essay im writing for work. only 2000 words to go. ick. vicki can i get your address please!! dont forget my pay it forward, 4 places remain. my email is victoriacanning@hotmail.co.uk so if you email me i will email you my address. i will also do the PIF thing too!! !